Lee Jensen of Mammoth Lakes, California, was very proud of this picture of his wife, Sara, with her California G3 buck. Sara was the successful bidder for one of the Open Zone tags for the 2000 season. The Open Zone tag allowed Sara to hunt during any of the deer seasons and special hunts. During the G3 hunt, Sara spotted her buck bedded down at about 250 yards and after a little case of buck fever, made a great shot. 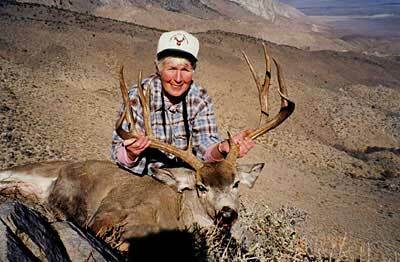 Her 5x4 buck had a 27-inch wide rack. During the 2000 California deer season, the Goodale Buck Hunt (G3) had the highest hunter success percentage at 76%. It was also the most difficult tag to draw in the deer tag drawing  2,187 applicants for 25 tags, the odds were 88-1 to draw a tag for this hunt.